Mangia bene, caca forte, e non aver paura della morte! Okaka mayo, a really fun sauce to say. 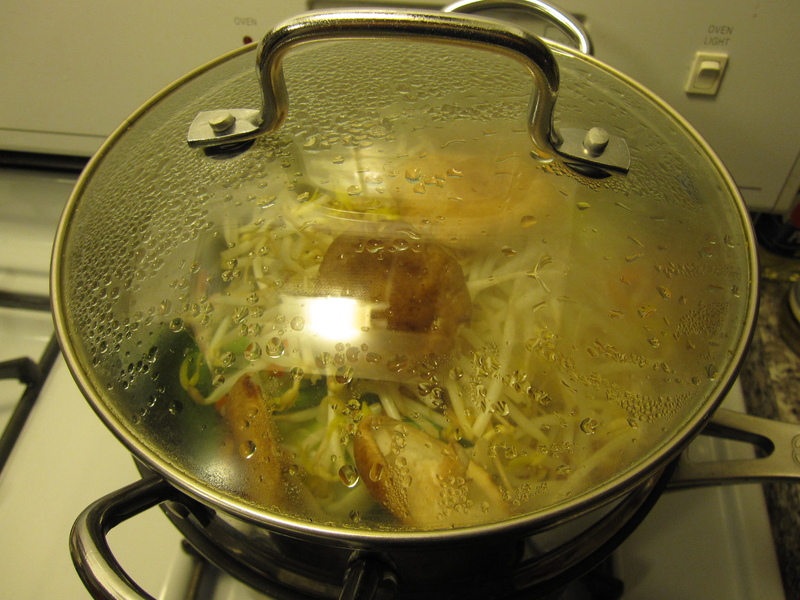 It’s also a delicious, very Japanese, sauce that’s easy to make. 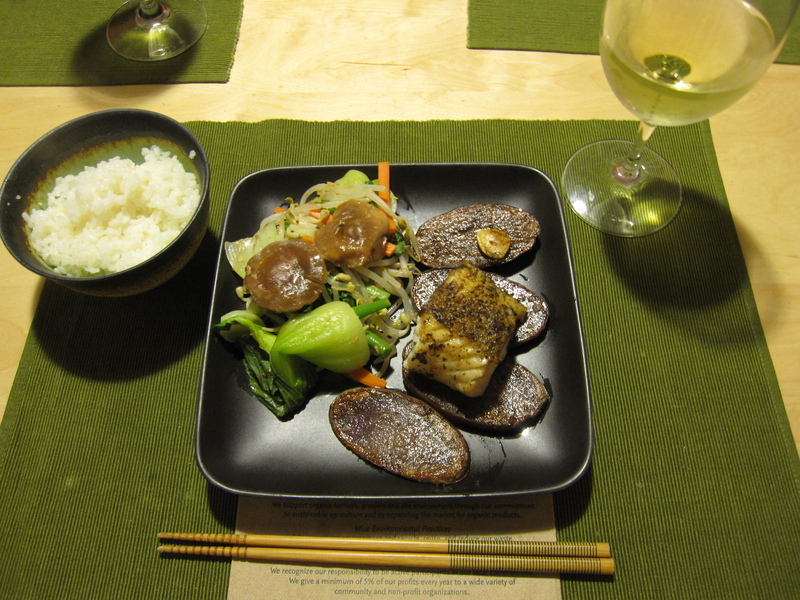 This is a dish that Yuki made the other night. To start, Yuki steamed some vegetables. Once the steamer got going she put in a couple of baby bok choy, a carrot cut into match sticks, and a handful of green beans. 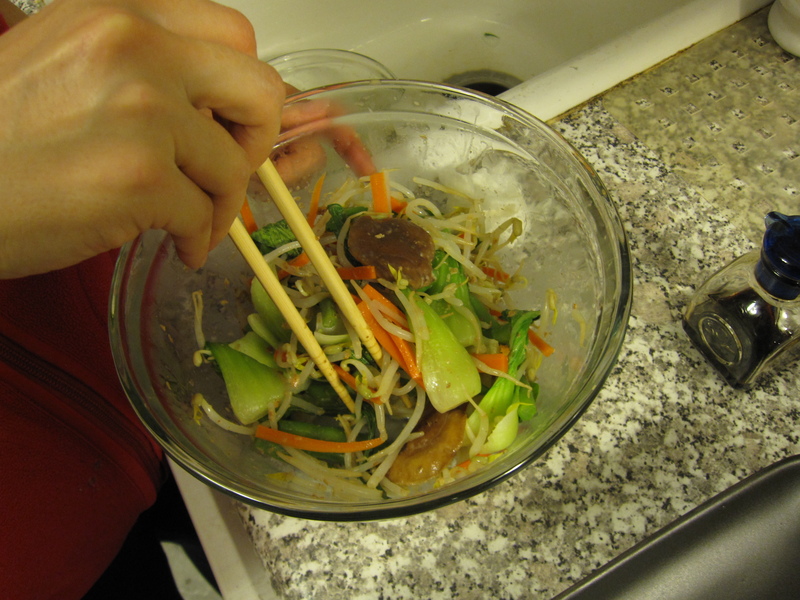 A few minutes later she threw in some bean sprouts and some fresh shiitake caps. 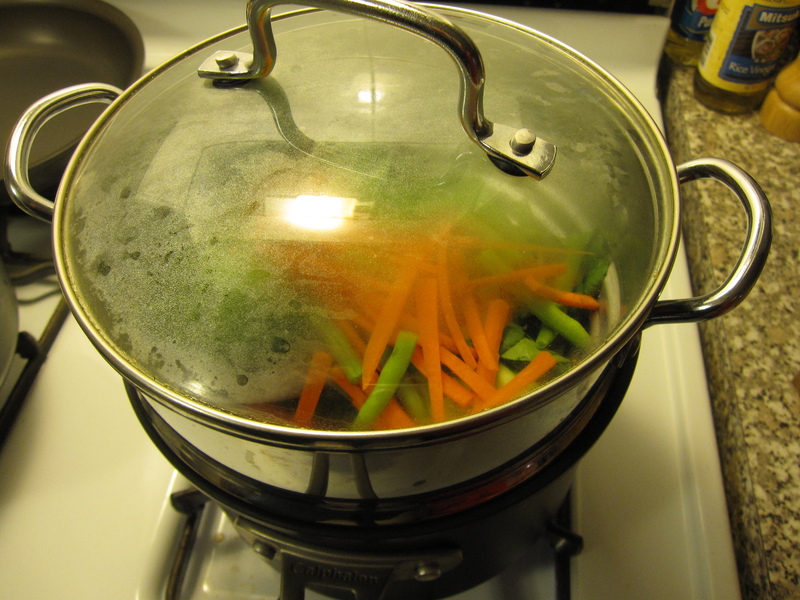 She let everything steam for about 5 minutes or so, just so that the veggies are al dente. While the veggies were steaming she mixed up the okaka mayo. 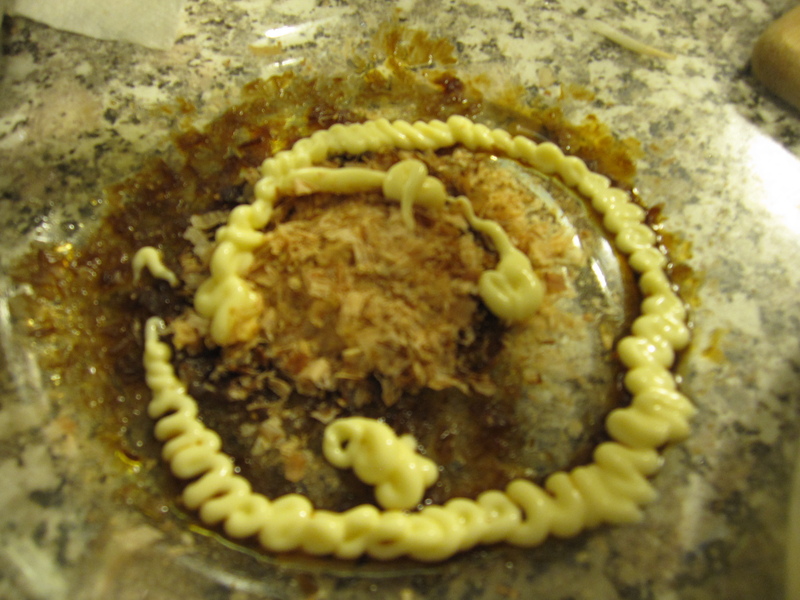 Okaka is a sauce that is often used for onigiri. It’s simply a mixture of soy sauce and bonito flakes (available at most grocers these days in the Asian section). To that, she squirted in some mayonnaise and mixed it all up in a bowl large enough to hold all of the vegetables. I have no idea what the measurements were. Just taste it and adjust according to your preference. Then, she got the sea bass going. In a saute pan she melted some butter and added some sliced garlic. She let the garlic cook a little in order for its flavor to absorb into the butter. 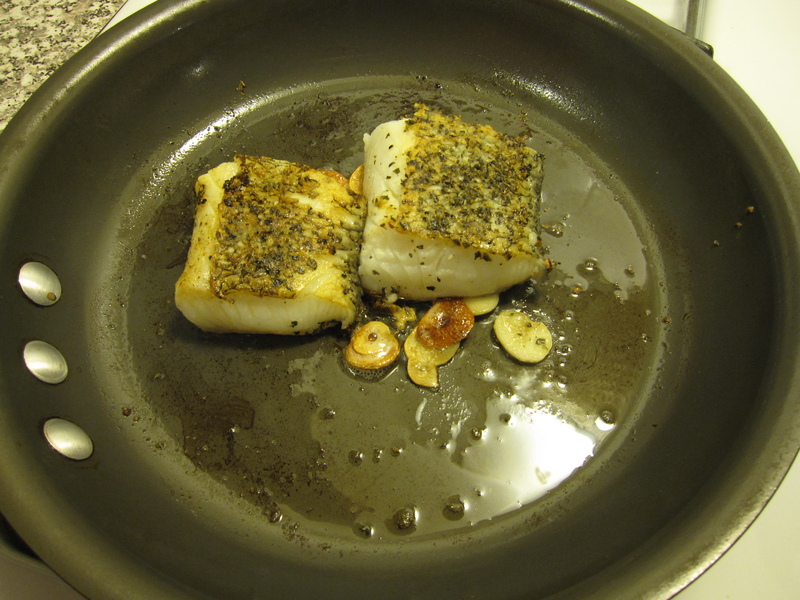 The sea bass was seasoned with salt, pepper, and dried basil. She cooked it skin-side down first in order to get a nice crisp skin. After a few minutes she flipped it over to cook the top. In total, the fish only needs about 8-10 minutes of cooking. Sea bass stays moist, but you still don’t want to overcook it. It will continue to cook for a few minutes inside after you take it off the heat. While the fish was cooking she tossed the steamed vegetables in the okaka mayo. While she was doing all of that, I was charged with the difficult task of potatoes. I melted some butter in a large skillet and let it get ridiculously hot. 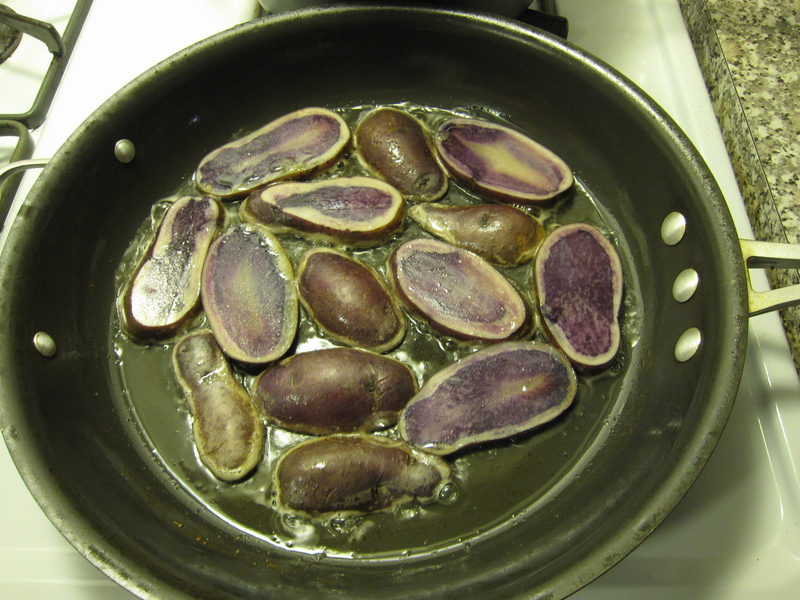 Then I added thin sliced purple potatoes in a single layer. The hot butter gave it a really nice crust. After about 3 or 4 minutes I turned each slice over and turned the heat down to medium. This allowed the inside to cook while also crisping up the bottom of each slice. While that was going on I sprinkled a little salt and pepper on top of everything. Everything was served with white rice. It was extremely tasty!